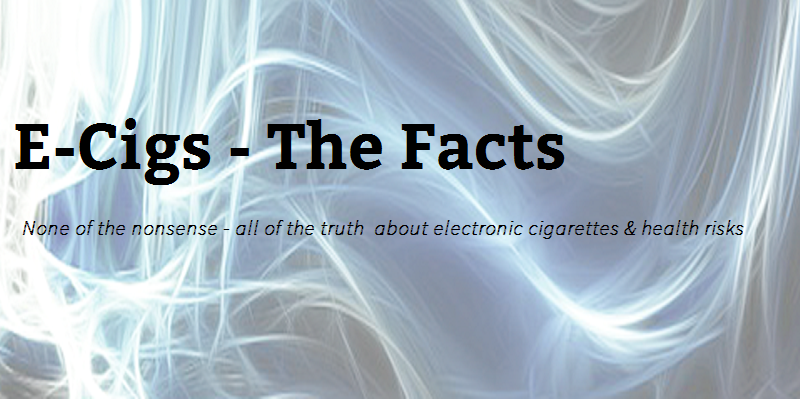 Home › E-Cigs – The Facts › What is Vaping? I know that when I started out down this road I had no problem finding thousands of websites on e-cigs. Unfortunately, most of them were really just trying to sell and they didn’t help me much. No – In fact, they didn’t help at all. 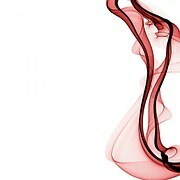 I had no idea what vaping was, what e-juice could be – or why I needed it. The term ‘vaping’ was (probably) first used by Rob Stepney in “Why do People Smoke” which was published in the now defunct journal New Society in 1983. He described “an inhaler or ‘non-combustible’ cigarette, looking much like the real thing, but…delivering a metered dose of nicotine vapour. (The new habit, if it catches on, would be known as vaping. )” Stepney admits that he may not have actually invented the term but it was the earliest reference I could find to it. I could have produced a page here with links to cigalikes – after all, that is how I got off cigs myself and, to be honest, the commission on some of them for affiliates is really high. You could probably make a mint! I started this site out of a genuine desire to tell the truth & correct some of the misinformation in the media. I’ve worked hard, for long hours (with no payment) trying to fight the cause of vaping. In fairness, back in 2012, I did toy with the idea of importing (decent) e-cigs from china in bulk & selling them on but I got caught up in the political crusade and any idea of a new business soon disappeared. So, that brings me back to those new to vaping – e cig beginners if you like – & how to advise them without trying to push a particular brand. If they were good enough for you, why not? As I’ve openly said, I got off tobacco cigarettes using a cigalike. It was a bloody expensive cigalike but it was, nevertheless, a cigalike. I didn’t actually use it for much more than a couple of weeks before I upgraded to a better device – but it did get me off smoking completely and my dilemma in creating this page is rooted there; it worked for me, so why shouldn’t I suggest them? Well, the answer lies in the fact that I only used them for a couple of weeks before (spending more) on another set of kit. The initial appeal was that they were automatic (no need to press a button), they were about the size of a normal cigarette and appeared to be hassle free. Their advantage is that they are self-contained. You don’t have to worry about refilling with e-liquid and they come with a dedicated charger or are just disposable. I won’t diss cigalikes completely because I owe them big-time for getting me off the cigs. But I also remember the purchase of additional batteries and cartridges (aka cartomisers) in those first two weeks. I remember buying an additional usb charger so that I could charge two batteries at the same time and I remember sitting in front of a computer with both front usb ports permanently filled with charging e cig batteries. I remember going into the garden for an hour or so & having to come back in for a new battery or cartomiser & thinking that normal cigarettes were much more convenient. If you search e-cig vendors, you’ll find several claiming that a cartomiser is the equivalent of a pack of twenty cigarettes – that is complete tosh. Because they’re used differently, ‘equivalence’ is a bit of a nonsensense anyway. For what it’s worth (& that’s not much )I found that I’d get through at least two cartomisers in a day and sometimes four or more. Now, you might think that that’s not really a problem but consider the cost of the things. 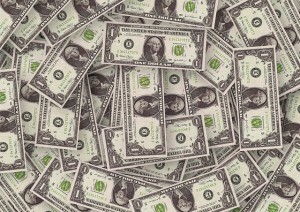 I found in those first two weeks that it was costing me more than smoking did! But I don’t want a sonic screwdriver! So, it seems to me that I shouldn’t point people to cigalikes. I can perfectly understand their appeal to a smoker wanting to switch but it would be bad advice to suggest them. I can remember seeing someone with what looked like Dr Who’s sonic screwdriver walking down the street in town and do remember thinking what a stupid idea it was having something so huge – and, horror of horrors, you had to push a button to use it. In fact, getting used to pushing a button is a lot easier than I thought but more on that later. For those people who find the prospect of constantly charging batteries and changing cartomizers daunting, read on. The options these days are mind-boggling. What these all have in common, though, is that they’re akin to buying hifi-separates. You’ll need one or more batteries, something to charge them & some sort of tank to hold the e-liquid. First, let’s have a look at the power supplies. There are unregulated devices which, effectively, are a battery compartment with a button. Beginners should steer well clear of these because unless you’re familiar with ohms law, battery safety & have the knowledge to match a tank to the device, it could quickly end in tears … or the emergency room. They’re perfectly safe in the right hands but you definitely do need to have some experience & knowledge to use them safely. Next up there are enclosed batteries which have simple circuitry. 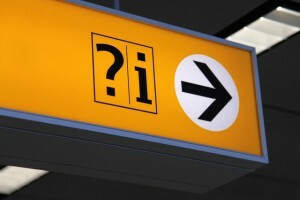 Most, if not all of these, are not automatic – you have to push a button to use them. Although many smokers might initially think that an automatic is the best choice, pressing the button does become second nature remarkably quickly. Commonly, this type of device has an internal circuit which regulates the output voltage to a constant level & when they need recharging, the button, which has an internal LED, flashes to inform the user. Whilst these are very common, it’s important to buy quality because there have been instances where unscrupulous manufacturers have used smaller cells inside the case than the value marked on the outside and weighted them to make them feel more substantial. It is also vitally important to only use the charger supplied with the battery, never leave them unattended whilst charging & take them off the charger as soon as they’re charged. The next generation of devices feature variable voltage and/or variable power levels. There are some devices available which have fixed internal batteries (such as the MVP) and these are regarded as disposable once the battery life is over. However, All of the other devices shown here use separate batteries which are usually charged in a separate charger, though some can be charged via a USB port. These allow the user to adjust the e-cig to suit their own taste & to change parameters to suit a particular e-liquid. They are usually used with atomisers (heating coils) with a resistance above 1 ohm & a common value is 2.1 ohm. 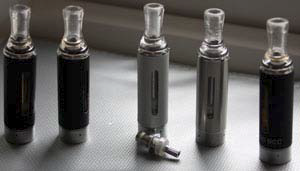 Most have a display screen which shows the voltage or power setting and most also have the ability to check the battery state and resistance of the attached atomiser. They come in all shapes and sizes from the tube style (shown on the left) to the box mod (shown on the right). The newest range of devices use temperature control, where electronics monitor the resistance of the coil & adjust the power level sent to the atomiser in order to maintain a pre-set temperature. The user can adjust this temperature to suit their own preferences and e-liquid. The majority of these require the use of coils made from particular alloys because the temperature isn’t sensed directly in the device but calculated from the change in resistance of the coil as it heats up. These often use coils with values below 1 ohm and high power levels which requires the use of batteries with the ability to deliver the high power necessary safely. Whilst there have been no accidents so far with these mods, they are probably best avoided by beginners unless they have a good knowledge of battery safety or are supplied by a competent dealer as a complete kit, preferably with detailed instructions on the type of replacement batteries to buy in the future & the type of tank to use with them. 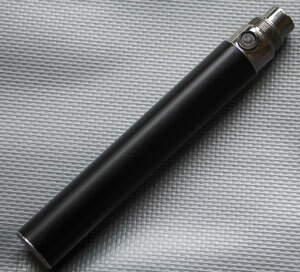 There are many different sizes of battery used in e-cig mods but probably the most common is the 18650. 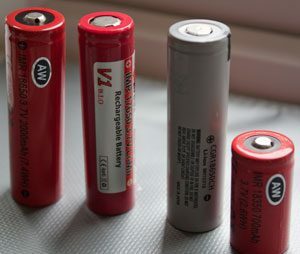 The three batteries on the left in the picture are 18650’s. Batteries can have a protection circuit built into them or be ‘unprotected’ and it’s important to know the appropriate type to use in your device. They also have a number of ratings which are usually printed on them. The first is their capacity which is shown in milliampere/hours (mAh).The higher the mAh, the longer the battery will last. In smaller vv/vw devices, this is the main thing you need to know. In any device which uses low resistance coils and higher power, you also need to be sure that any battery used meets the pulse & discharge rates required. So, we have our power source & now we need something to put e-liquid in. There are so many types & sizes of tanks that it is impossible to cover them all here individually and even the different types would require an article much longer than this whole page. Is the tank made of glass, plastic or metal? Plastic tanks are fine for most e-liquid but there are some e-liquids that react with polycarbonate & cause them to become cloudy or crack over time. Other plastics seem to be ok but, as a result, many people prefer glass or steel. Glass has the advantage, of course, that you can see how much liquid remains. So what do I recommend for a beginner? Well, this really is a hard question in some ways. Many e cig beginners get overwhelmed by all the choices and recommendations available to them and it’s hardly surprising. What I think is the best starter option will not be agreed by everyone. Vaping tends to be a journey of discovery & I think it is probably a journey we all need to make to find out what really is right for us. That said, there are some hints above – don’t go with a cigalike, don’t go with a ‘mech mod’, don’t go sub-ohm. There are others that I didn’t cover above like don’t try to start with a rebuildable, don’t buy a cheap ego off a market seller and don’t fall for the ‘get a free e-cig when you sign up for our monthly juice delivery’. In my opinion, there are so many things to learn that it is almost certainly best to go for a mid-range starter kit that has more than one battery, a charger and a clearomiser like an evod or protank. A kit like that will probably help to get you off the smokes & while you’re using it you can research your next step. With e-liquid( you’ll also hear ‘vape juice’ and ‘vape liquid’), the range of flavours & costs is very wide. Don’t think that buying the most expensive is the best course. Giving up smoking means that your sense of taste will improve over the first few months and an e-liquid that you like at first may not be one you enjoy six months hence. So, the best thing is to try a small range and be open to new experiences – For example, I never enjoyed menthol cigarettes but I often use juices with menthol in them. It can make juices you don’t particularly like vapable too! Regarding strength, many start on 18mg/ml. Personally, I think a heavy smoker needs a juice stronger than this – I started on 24mg/ml and I know others who found they needed 36mg/ml at least at first. Some folks have asked if it isn’t better to use prescribed quit smoking aids and have raised things they’ve seen in the media about vaping vs smoking where the press say that vaping is just as bad as smoking. Please don’t be put off by this very poor journalism. I’ve written numerous posts about these articles which you can access via the menu button above or you can jump to my page on e-cig health risks which debunks some of the myths put about. Personally, I found prescribed products were ineffective and didn’t address my cravings at all well. If they work for you, then great but I know my experience is far from unique as it’s something many vapers will tell you.